Note: Please read the entire description of our Breckenridge home. We have provided many details to answer all of your questions. For additional photos and information, please see our website link below. 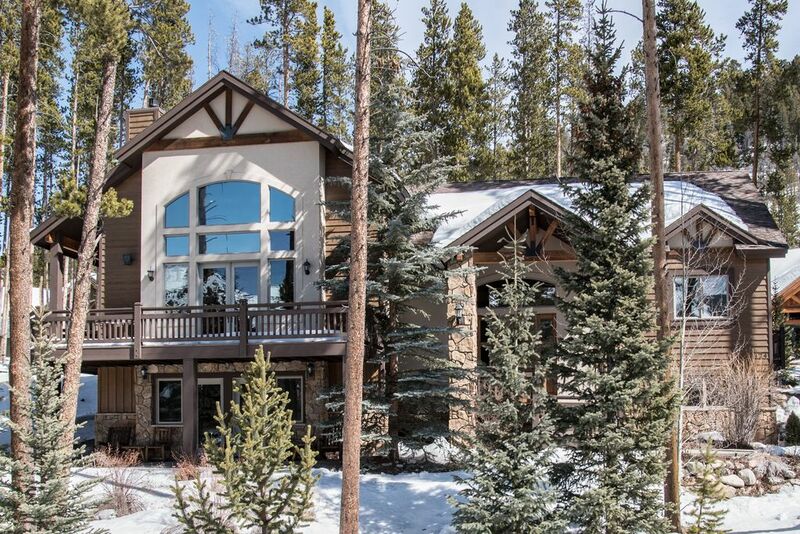 This luxury mountain home is located in the heart of Breckenridge, Colorado. It offers everything with 4,200+ square feet, five bedrooms, two living rooms, four and a half-baths, and a three car heated garage. Our home is located in prestigious Sunbeam Estates right in the middle of town. The bus stop is located only a half block away in the ice skating rink parking lot. The free bus service takes you the five blocks to the ski area of Breckenridge and drops you at the base of the ski lift. Breckenridge is located in Summit County and is close to Vail, Beaver Creek, Keystone, Copper Mountain and Arapahoe Basin ski areas. Ride the Summit Stage to shop or ski at Keystone/A-Basin, Copper Mountain, Frisco, Silverthorne, and Dillon. An indoor and outdoor ice skating rink is one-half block away and the town sledding hill is two blocks in the other direction! Main Street is just a short ten minute walk where you can enjoy shopping and fine dining. The riverwalk and paved bike trails are three blocks to the west or you can jump on the mountain bike trails right from the garage door! Deluxe chef's kitchen with granite counters, double ovens, Thermadore gas range and TWO dishwashers. Elegant dining room table seats ten with additional seating for four at the kitchen table. We have four barstools around the giant kitchen island/bar. Home theatre system with 90' screen in the lower level with surround sound, digital cable, DVD and VHS players. Outdoor hot tub on wrap-around deck with breath-taking ski area views. Magnificent great room with a moss rock fireplace that soars 20 feet to the vaulted ceiling. Luxurious Roman marble master bath with jetted jacuzzi tub and double-headed shower and steam room. Surround sound music individually controlled from every room. Majestic mountain views of Peaks 8, 9 and 10 from nearly every room of our home. Home office which may accomidate up to two adults on the pull out sofa. Complete laundry room with large utility sink located off the kitchen and master bedroom for convenience. The main floor consists of the great room, half-bath, dining room, kitchen, laundry room, and master bedroom. The master bedroom has a king size bed, private deck and luxurious bath. The upper level provides guests with two bedrooms (one queen bed in the north room, and one twin bed and one bunk bed with a full size and twin bed in the south room) each with full baths. The lower level includes a second living room which will entertain you with a wet bar, foosball table and 90' giant screen home theatre system, two bedrooms (one with king bed, the other with queen) and one full bath. Hello, my name is Jason and I live in Breckenirdge full time. I own and manage a few select luxury properties in the heart of Breckenridge and Frisco for myself, neighbors and friends. I'm also a Colorado Realtor. Please contact me with any questions. I look forward to seeing you in Breckenridge! All of my homes are in prime locations in the heart of Breckenridge. We (a group of 9 friends) spent a marvelous week at Sunbeam Estates. All was as advertised. The house was very clean and well appointed, we especially enjoyed the movie theater and hot tub! Jason was very attentive to all of our needs and we highly recommend this house to all for a great vacation in Breckenridge. Really enjoyed the space and amenities that this home had to offer. We had plenty of space for 2 families of 5. I really liked that we could park a tahoe and F150 in the garage overnight while it snowed. The one item that would have made the experience better is to have the big pothole at the base of the driveway fixed. Thanks for letting us enjoy your home. Beautiful property with great views of ski runs and lots of amenities! Plenty of space for families to enjoy time together or spread out and relax in separate areas. Close to shuttle and town. Great place, great location and the house has verything you will need for your stay! We had a great time staying at the Treasure of Klack. Jason was great to work with and our accommodations were fantastic. Loved the house. Couldnt have asked for anything better. We enjoyed our time at breck and the house. Was everything we needed and more. Jason was very helpful and responsive. Will be back!